Virtual reality is like the wild west right now. There are no rules, there’s a gold rush underway and titans of industry are in a race to define the future. Unfortunately, if VR is either poorly made or used incorrectly it can make people feel sick. The best virtual reality software, however, can affect people in ways they can’t control, like giggling in wonder, screaming in fear or crying after being deeply moved. The first companies prepping consumer VR systems, including Google, Sony, Facebook and HTC, are trying to find a sweet spot between affordable hardware, easy-to-use software and compelling apps. Eventually VR (and closely related augmented reality technology) will fundamentally change the way people live, work and play but that change starts not just with gadgets that are so affordable anyone can buy them, but those which are so entertaining and useful people keep coming back. 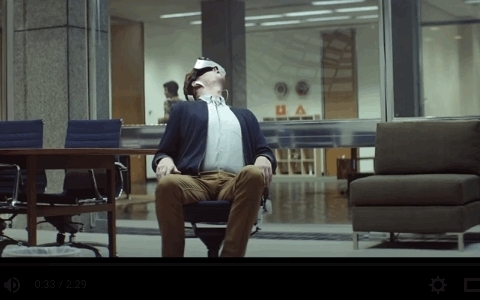 This gif captured from a Samsung advertisement shows the Gear VR, an advanced mobile VR system. While fully portable, it is being used while seated in a swivel chair because it can only track movement in a very limited way compared with wired systems. You can already go to a store and buy cell-phone powered accessories that can show some kinds of VR and the first modern PC and game console-powered consumer headsets are on the way. In other words, there is already a range of content and VR devices from which people can choose. Some are already planning their purchases for the next year and we thought it would help to outline the different kinds of VR for anyone interested in adopting the first generation of this technology. In the simplest terms, VR can be broken down into mobile and wired systems. Each has its advantages and can be broken down further into basic and advanced systems. This post breaks down the pros and cons of mobile VR for anyone interested in buying them while a companion article summarizes the differences between wired VR systems. We will update each of these posts as more is revealed. What it is: Using a smartphone’s display and sensors that detect its orientation as the foundation of a VR system is not exactly a new idea, but Google’s Cardboard project is the most common way of using a mobile phone to offer the very simplest VR content. Place your phone in a cardboard or plastic holder you can make at home for almost nothing or buy at a store for less than $30, download Cardboard-compatible apps and you’re ready to go. You can turn your head in any direction but must avoid bending forward, so Cardboard is probably best enjoyed while sitting in a swivel chair. The View-Master, available in stores now, is a $30 plastic holder. It is fully compatible with Google Cardboard apps and you can place a wide-variety of phones securely inside. There’s a lever on the side of the View-Master and, when pressed, it pushes against the touchscreen of the phone as a simple way of interacting with a VR experience. You can do this to select objects you see inside VR. Pros: Cardboard can introduce people to the basic concepts of VR. It is extremely inexpensive because you can turn your existing smartphone, iPhone or Android, into a VR system with little more than a cardboard shell. Panoramic movies (videos shot with multiple cameras and stitched together at the seams in 360 degrees) are some of the easiest content to make for VR so these movies are relatively common. Cardboard will show you these movies with similar fidelity as a more expensive headset. Cons: You aren’t going to be spending more than a couple minutes inside a Cardboard VR system and it might not be a great experience. You have to hold it to your head with your hands and, with single button control, it features limited interactivity. In addition, software might not be properly made for the range of phones said to be compatible with Cardboard, potentially leading to stomach-churning experiences. You also have to remove the phone from the Cardboard holder each time you want to launch a new app. What it is: Gear VR is a Samsung phone holder in the form of goggles. It is compatible with Samsung phones and combines with software from Facebook’s Oculus and downloadable apps created by a range of developers. Gear VR is similar to Cardboard in that it is likely best experienced while seated in a swivel chair, without bending forward. However, its adjustable straps mean it fits snugly to a variety of head sizes and frees up your hands to tap, swipe or press buttons for more interactive VR experiences. There’s also a dial on top to adjust the focus just right for different people. Unlike Google Cardboard, the moment you put on the headset you are inside a virtual experience and able to launch a variety of VR apps from inside there. The Gear VR headset costs $100, and it fits some of the world’s most popular phones, namely Samsung’s flagships including the Note 5, S6, S6 Edge and S6 Edge+. The Gear VR features a touchpad on the side that can be tapped or swiped as a simple but effective input system for interactive VR experiences. Many apps built for Gear VR also work with Android-compatible Bluetooth gamepads too, which can be less tiring to use than tapping the side of the headset. The gamepad controllers also allow for a wider variety of ways to interact with an app or game. A compatible gamepad can be less than $50. Pros: Strapping goggles to your head is a huge improvement from holding Cardboard against your face. Launching different apps while staying inside VR is easy and the touchpad and gamepad open up a universe of more interactive games and immersive experiences compared with those available on Cardboard. Apps like Oculus Video, Oculus 360 Videos, Oculus 360 Photos, as well as Netflix, allow for viewing a ton of content in VR ranging from traditional home movies to Hollywood blockbusters, as well as the same kind of panoramic videos or photos commonly viewed in Cardboard. Minecraft is also coming to Gear VR and Oculus Social offers a way to socialize with others while immersed. Great apps: If you get a Gear VR then Smash Hit, Netflix and Titans of Space are examples of the cool apps available for the platform. Smash Hit is a game originally designed for mobile phones and tablets but adapted beautifully to VR, Netflix is a virtual home theater offering access to its entire library of streaming content and Titans of Space is an educational app showing the scale of the solar system. Cons: The limitations of Gear VR are only apparent when comparing it to other platforms. If you don’t have a swivel chair or you don’t buy the separate gamepad you may not get the most out of Gear VR. By modern console and PC-gaming standards, the games available on Gear VR are graphically simplistic even if you do see a virtual environment wherever you look. Even if you use it right, some apps are not comfortable for some people.